I don't know about you, but shopping for the men in my life is never a walk in the park. My mind definitely doesn't operate like a man's does! 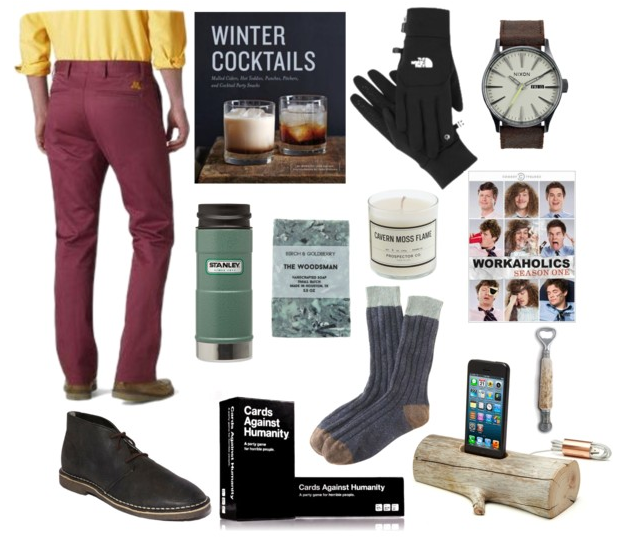 Creating a men's holiday gift guide is really helpful for me to brainstorm what to buy for the gentlemen. on my list. If you have as hard of a time shopping for them as I do, I hope this gift guide alleviates some of your shopping stress! Pants: Dockers makes amazing collegiate-branded khaki pants. They graciously sent me a pair for Jack, and he loves them. There's nothing better to wear on gameday! Especially if you have any collegiate sports fans on your list, these pants are a great option. Book: While you can't go wrong with a good book, a winter cocktail book is a timely, unique gift for the man who likes to entertain. The winter cocktails book below has some great seasonal recipes. Outerwear: You can't go wrong with a good pair of winter gloves, especially for the men who brave the arctic chill of the Midwest. I'm a big fan of The North Face, myself. Watch: Nixon makes a great watch. I bought one for Jack a few years ago, and it's held up so nicely. In addition to being incredibly stylish, they're also affordable (hello, no-brainer). Thermos: I don't think I know an adult who doesn't enjoy a nice, hot cup of coffee. Soap: "The Woodsman?" I can't imagine a greater scent. Plus, how many guys do you know that don't use soap? Exactly. Candle: Candle's aren't just for women, especially when they smell like "Cavern Moss Flame." Yum. DVD: I'm a big fan of buying seasons of TV shoes on DVD, especially if they aren't available on Netflix. "Workaholics" is a personal favorite of Jack's, and received a "must own ASAP" recommendation for him, so it's safe to say it's a good gift. Shoe: I'm pretty obsessed with Chukka-style shoes. They can be dressed up or down and tend to look good on everyone, no matter what your fashion style is. Game: Cards Against Humanity. Enough said. Socks: Everyone loves a cozy woolen sock (it's true, there's research about that somewhere, I think). Not only are J. Crew's socks stylish, they're also unbelievably warm and cozy. The men in your life won't feel embarrassed wearing these socks at Christmas, his work holiday party, opening presents by the fire, or anywhere else. Phone Dock: A phone dock is a unique gift that most people would never consider buying themselves. Especially for outdoorsy men, this wooden phone dock is a wonderfully unexpected gift. Bottle opener: There's nothing manlier than throwing back a few craft brews, horned bottle opener in hand.